So the first day Autumn/Fall will be on the 22nd day of this month and I thought I would jump back in the wishlist'n thing. I decided to focus on accessories that involved sunglasses and jewelry. I was inspired by Elle magazine that featured what fashion needs that you will need to have a stylish fall list. 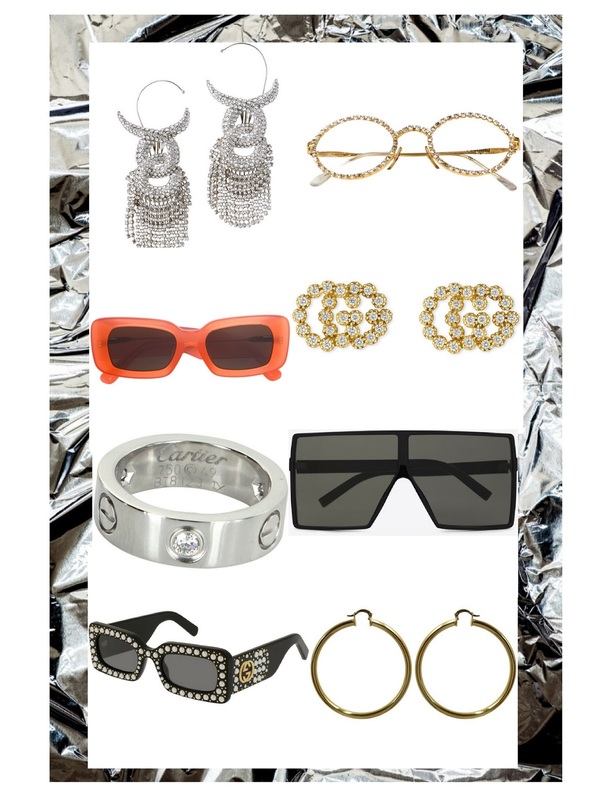 I decided to make this my accessories wishlist moodborad for sunglasses and jewelry that I want and need(chuckles). With the trends that are in, it's hard to allow the world see that you are not trendy but really appreciate the way each accessory is crafted. From big bold to simple glitz, I am all about color, shape, and nostalgia. The 90s decade will forever be imprinted in me and I love how designers are really channeling the decade with adding the 70s decade flare. Nostalgic admiration comes from the singer Sade, with Melody Ehsani inspired bold gold hoops to the rapper Lil Kim (I feel) orange block rectangular frames Linda Farrow collaboration with Dries Van Noten. 2.| Moschino special-edition jeweled frames. 3.| Linda Farrow Dries Van Noten x Linda Farrow orange rectangular frames. 4.| Gucci yellow gold running G diamond stud earrings. 5.| Cartier 3 diamond Love 18k white gold ring. 6.| Saint Laurent New Wave 183 Betty square frames. 7.| Gucci chunky studded black frames. 8.| Melody Ehsani Sade hoop earrings.